AutoSpeed - Bike LED Lighting Power! The other day I was in a major capital city, the cold winter dusk bleeding light from the sky. It was the most dangerous of times to be on the roads, with visibility poor and a thronging rush hour spilling cars and people onto the streets. And despite the chill, plenty of cyclists were hitting the road for the pedal home. 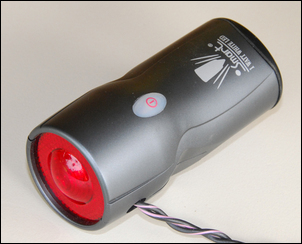 Bike lights have improved immeasurably over the years, the use of high intensity LEDs revolutionising the technology. But as my roadside observations showed, not all lights are of the same quality. In fact, pick up a bike magazine or check a few websites and you’ll soon see that bike lights vary enormously in price and claimed effectiveness. So what do you do if you want good lights, but don’t want to shell out big bucks? As we showed in the series Building a High Performance LED Lighting System, great things can be done with high power LEDs like those from Cree and Luxeon. But such an approach requires quite a lot of fabrication and the production of custom bike attachments. 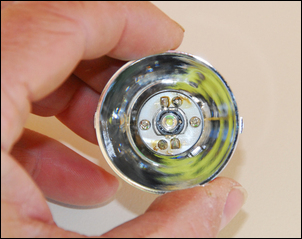 The starting point for our lighting system comprised two Smart 1W LED headlights. These are available from various dealers (disclaimer: including my wife’s business Speed Pedal), and cost about AUD$45 each. While there are plenty of criteria than can be used when selecting lights, the reason I picked these was because of their 1W LEDs. That’s a powerful LED and since it comes complete with reflector and optical diffuser (a “lens”), I thought it likely that the light output would be good. And so it proved, with the design having a flat, relatively wide and bright beam. However, the light had only one mode – ‘on’. That is, no flashing mode was provided. 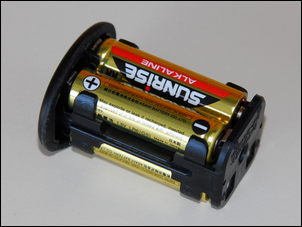 An internal battery pack comprised four AA cells, wired in series to provide 6 volts from conventional cells, and 4.8V from rechargeables. 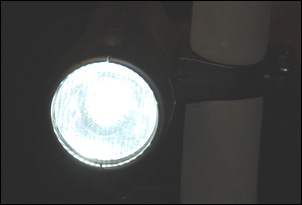 This story uses the Smart headlights, but similar results could be obtained from other high power LED designs. After assessing the quality of the beam and making sure that it was worthwhile proceeding with the project, the next step was to measure the current draw. 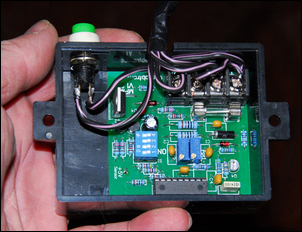 This was easily done by feeding power to the light and measuring the current flow with a multimeter. The Smart torch proved to have a current draw of 500mA at 6V. 500 milliamps is a helluva lot of juice to be drawing from a small battery pack. And, since amps x volts = watts, the power being drawn from the battery pack is 3 watts. But hold on! The LED is rated at only 1 watt! What is happening to the other 2 watts? The answer is that an unfair amount of it is being wasted in a dropping resistor. 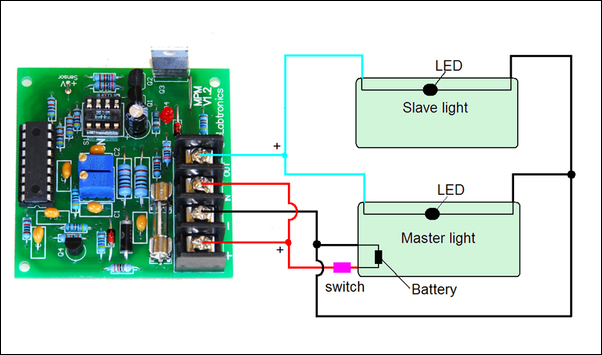 The LED requires less than 6V, with the voltage is decreased by a simple resistor. And, as you’d expect, that resistor gets quite warm. So a heap of power is being used up in the resistor (arrowed), rather than being utilised to produce light! A dropping resistor is a low cost way of regulating LED current, and so most cheap LED lights will use this approach (rather than a DC:DC converter). So what can be done to both reduce the current draw and also, as a bonus, massively improve the visibility of the light? The answer is deceptively simple - flash the light. 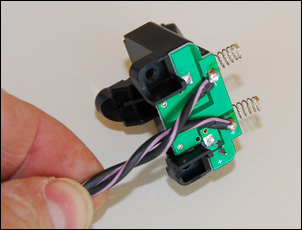 Making the technical decision easy was the presence on my desk of an eLabtronics Pulser. 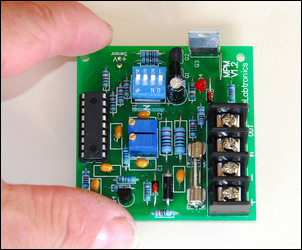 This module, that we’ve covered in the series starting at eLabtronics Pulser Part 1, is a compact electronic board designed to pulse (or flash) loads like lights, solenoids, horns and so on. It uses a high current output transistor (something very uncommon in cheap flashers) and can be adjusted both for the flash rate and also flash pulse length (and that’s also very uncommon!). At AUD$59 prebuilt, it is one of the cheapest off-the-shelf ways of flashing powerful LEDs while still having plenty of user adjustment. It is available from the AutoSpeed Shop. So what’s this about ‘user adjustment’? If you think of anything that pulses on and off, there are two different factors that can be varied. The first is frequency – how many times per second it turns on. For example, you might decide to have the LED flash 8 times a second – that’s very fast. Or, you might slow the rate down to 3 times a second. 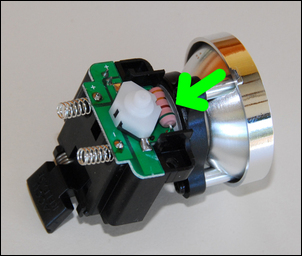 By turning the frequency pot on the module, the pulsing rate can be varied from 10 times a second to once per hour. In this application, once per hour might be a tad slow! The other aspect that can be varied is duty cycle. 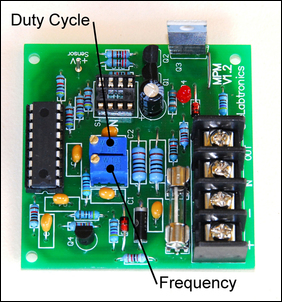 ‘Duty cycle’ refers to the length of time that the LED is on, as a percentage of the time available for it to be on. Confused? Don’t be. If for example the LED is set to flash once per second, and the pulse length is set at half a second, the LED is on for half the time. This called a 50 per cent duty cycle. If the LED is set to be on for one third of a second, the duty cycle would be 33 percent. And so on. By turning the duty cycle pot on the module, duty cycle can be adjusted from 0 per cent (ie the output is never on) right through to 100 per cent (ie output always on). Normally, of course, you wouldn’t have this pot set to either extreme. Now while this might all sound kinda technical for the sake of being technical, it’s really, really important. Why? Well, the Pulser module itself takes very little power to run – at 6V, about 5 milliamps. So we can ignore the current consumption of the module and look just at the consumption of the light. And with the Pulser, we can change that dramatically. 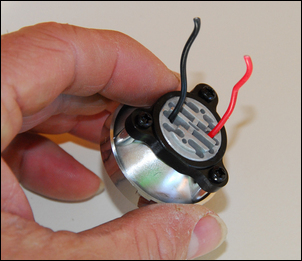 In its specs the Pulser is rated for an operating voltage of 10-40V. So how can we run it off 6V? The answer is that the 10V minimum is for the worst combination of switch and power draw combinations. Wired as shown in this story, the Pulser works fine on 6V. We talked about duty cycle above. Now let’s look at how we can make that work for us. If we set the Pulser to flash 5 times a second, and set the duty cycle at 10 per cent, we’ve reduced the power consumption of the LED light by a staggering 90 per cent! So instead of drawing 500 milliamps, we’re now drawing only 50 milliamps! But surely having the light off for 9/10ths of the time makes it completely useless? Not on your (literal) life! If you get someone to watch the light as you adjust the Pulser, you can soon come up with a frequency and duty cycle that’s incredibly visible but consumes very little power. Set the duty cycle to a fast flash rate and then gradually increase the duty cycle from zero. At the point where the watching person says ‘Hold it!’, stop your adjustments. To actually see the values you’ve ended up with, you’ll need an oscilloscope, but just doing it by eye resulted in a measured 5 times a second flash rate at 12 per cent duty cycle. The measured average current draw at 6V was only 60 milliamps. OK, now you’re saying to yourself, hold on! That’s all very well but how many dollars was that Pulser module? Couldn’t I just do all this more cheaply with some off-the-shelf bike lights? Maybe – but here’s something else to consider. 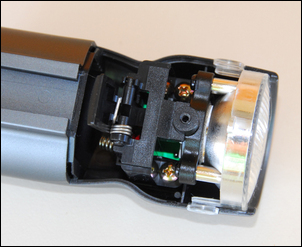 A single Pulser can run effectively as many LED lamps as you want, so you can add at will side-facing lights, more headlights or more tail-lights. You can be a (very safe) flashing Christmas tree! Let’s take a step back. We’ve got our generic, cheap but power-hungry 1W LED lights. We’ve also now got a way of reducing their energy consumption by up to 90 per cent while actually making them far more visible. In fact, the energy consumption is so much less that we may as well run both the headlight and tail-light from just one of the original battery packs, saving quite a lot of weight. But how do we achieve all this? ...and then new extension wires soldered to them. Note the retained LED dropping resistor, which was relocated as shown. The wires to the battery connections were soldered into place. The joins were insulated with tape and the headlight reassembled, with the two sets of wires fed out through a hole in the body. 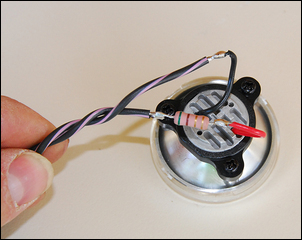 As it contains the batteries, this modified light can be thought of as the ‘master’. Oh yes, and the clear lens was swapped for a red one salvaged from another tail-light. The wiring can be divided into two sections. 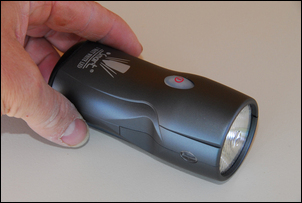 The battery pack in the ‘master’ light feeds power to the Pulser. So that the Pulser switches on whenever power is applied, positive power is fed to the ‘in’ terminal as well as the ‘+’ terminal. 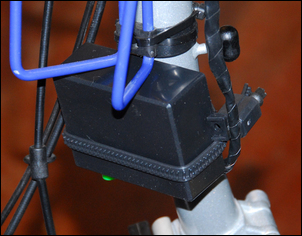 The ‘out’ terminal of the Pulser connects to the positive side of both LED lights while their negative terminals connect back to the negative side of the system. An on/off switch goes in the positive supply line. Note that the LED dropping resistors are not shown on this diagram but must be retained. No heatsink is needed on the Pulser’s output transistor (MOSFET). The Pulser was mounted in a box and a switch placed on its underside. (The box is available here). The headlights and tail-lights were mounted, and the wiring completed. But the key is the control that you have over the flash rate and duty cycle. Twiddling these pots makes a radical difference to the power consumption of the system and yet it’s easy to come up with settings that work extremely well, both for visibility and watts consumed! The eLabtronics modules are engineered and manufactured by eLabtronics. The modules are based on concepts and specifications developed by Julian Edgar, with the aim being to provide cost-effective and useful modules for car modification (and also industrial and educational and bike uses).